The succession of Grand Canyon strata (left) matched with the complete sequence of Earth Time to show the number and duration of the gaps in the Canyon record. lecture at the University of Cambridge, entitled 'Life on Earth: Its Origin and Succession'. Phillips took the opportunity to review what was then known about the fossil record and how it could be viewed in the light of Darwin's expanded theory of evolution. He argued that Darwin had grossly overstated the imperfection of the record. More importantly, he thought the record good enough to test Darwin's claim that there had been extremely slow changes between species over the great length of geological time. Phillips said that despite the vastness of the geological timescale, there was no fossil evidence for Darwin's minute transitions. Furthermore, the growing body of data seemed to show that even the earliest fossils found in the rock record were representatives of complex organisms. Phillips expanded his lecture into a short book, which was illustrated by a famous diagram of the changing diversity of life throughout geological time (see p. 204). Although he showed that life had an overall increase in diversity from the beginning of the Palaeozoic Era to the present, it had also suffered two very marked dips. These dramatic declines in diversity marked the end of the Palaeozoic and Mesozoic Eras and, of the two, the end-Palaeozoic collapse was the greatest. But Phillips was not using the diagram to argue that there had been extinction events; rather, he wanted to show that the history of life could be divided into three great eras that were of more general application than the proliferation of regional divisions of strata. If we ask ... whether any dependence is certainly proved between the antiquity of the strata and the forms of plants and animal remains which they contain, we receive a satisfactory answer. There is proved to be a real and constant dependence of this nature, such that in every large region yet studied, where fossils occur in strata of very unequal geological age, there are whole groups of organic forms which occur only in the oldest strata, others which prevail only in the middle, and some which are confined to the upper deposits. If instead of classifying the strata by mineral or chemical analogies, we resolve to employ the characters furnished by successive combinations of organic life which have appeared and vanished on the land and in the sea, we shall obtain an arrangement of remarkable simplicity, more precise in application, and less disagreeably harsh in definition, than that which has been so long followed. We shall have three great systems of organic life, characterizable and recognizable by the prevalence of particular species, genera, families, and even orders and classes of animals and plants, but yet exhibiting, clearly and unequivocally, those transitions from one system of life to another, which ought to occur in every natural sequence of affinities, dependent on and coincident with a continuous succession of physical changes, which affected the atmosphere, the land and the sea. By 1840 enough was known about the fossil record for Phillips and other palaeontologists to realise that extinct fossil groups such as trilobites and graptolites were ancient life forms restricted to strata of the Palaeozoic Era. The middle life of the Mesozoic Era included distinctive 'saurians' - extinct reptiles such as ichthyosaurs, plesiosaurs, pterosaurs plus the puzzling giants Iguanodon and Megalosaurus that, in 1840, had yet to be characterised as dinosaurs. Finally, the Kainozoic Era (generally referred to as Cenozoic these days) of 'recent life' has its mammals, birds and flowering plants. The renaissance of mass extinction as a significant mechanism for change in the history of life had to wait for the best part of 100 years. While the turnover in kinds of animals and plants was recognised, it was taken as a matter of fact without much exploration of why it had happened. It was the question of why the dinosaurs died out that finally prompted the renewed investigation of the possible causes for mass extinctions. But the most puzzling mass extinction event is that marking the end of Permian times. Although it seems to be by far the most catastrophic extinction, no single cause has yet been identified, but a number of contributing factors are known. Plate movements had assembled the continents into a supercontinent known as Pangea, which stretched almost from pole to pole. Continental shelf seas were drastically reduced in area, as was the available ecospace for the main diversity of marine life that makes up the fossil record. For instance, the Palaeozoic corals were completely wiped out so that primary production and marine diversity built around reefs were devastated. Many of the landscapes of the continental interior of Pangea were inhospitable environments for the still emerging land-living plants and animals. Continental climates produced vast areas of aridity with huge deserts inimicable to life. Plant communities on land were not wiped out overnight, but progressively collapsed until there was not much left except a few ferns and clubmosses. There were major episodes of volcanism with vast outpourings of plateau lavas, especially in Siberia, which could have caused climate change. But as yet no single 'smoking gun' has been identified, despite the expenditure of a lot of effort looking for one. There are many experts who would dearly like to find evidence for a large meteor or asteroid impact because it would help bolster the arguments about the other big extinction event that closed the Mesozoic Era, namely the end-Cretaceous impact event. Here there is no doubt that a large (i i km wide) rocky 'missile' from outer space blasted into an area now known as Chicxulub in the Yucatan region of Mexico around 65 million years ago and made a big hole, generated shockwaves, tsunami, wildfire and climate change. This event does indeed coincide with a major extinction event in which the dinosaurs and some of their relatives were wiped out, along with the ammonites and many other sea creatures. The big question asks how an impact event in one part of the world could have had such a global impact? There have been many other impacts in Earth Time, some of them just as big, but they have not apparently caused significant extinctions of life. And as far as we know, the biggest extinction event, that of the end Permian, cannot be linked to an impact, so was there something special about the end-Cretaceous event or was it perhaps just one ingredient in another multifactor catastrophe? The end Cretaceous was also marked by vast outpourings of plateau lavas, especially in the Deccan region of India, which again may have instigated climate change. The whole problem of such extinction events is intriguing and important for our understanding of the history and evolution of life. Do not believe all you read about such events. Even experts who have devoted the best part of their working lives to the study of major extinctions are still trying to assess the details and put together workable scenarios. Take the question of wildfire after the Chicxulub impact. It is often taken for granted that thermal radiation was so great that global wildfire destroyed much of the land vegetation and therefore terrestrial primary production. The supporting evidence is supposed to be the widespread occurrence of fossil charcoal and soot in the appropriate sediments. However, recent re-examination by British palaeobotanists Margaret Collinson and Andrew Scott of the critical sections in North America, where the wildfire should have been at its worst, does not support this argument. The amount of charcoal is actually less than background levels found in adjacent Cretaceous strata and there are abundant fossil plant remains to be found in the boundary layers that show no sign of charring by wildfire. East of the Grand Canyon, the Navajo Reservation exposes spectacular Triassic-age strata that contain the trackways of large terrestrial vertebrates. To the southeast in New Mexico, over iooo skeletons of small, bipedal dinosaurs were found buried within Triassic river sediments of the Chinle Formation by American palaeontologists George Whitaker and Edwin Colbert in 1947. The so-called Grand Staircase plateaux region of northern Arizona and southern Utah includes famous conserved landscapes such as Vermilion Cliffs, Zion National Park and Glen Canyon National Recreation Area. The strata of this region were originally laid down in depositional environments that fluctuated from wind-blown desert sands to the deposits of rivers, lakes and shallow seas. The 186-million-year-long record of Mesozoic life that they contain is remarkable. It ranges widely from huge petrified trees and remains of many different kinds of dinosaurs to smaller, back-boned animals such as primitive mammals, as well as aquatic beasts from crocodiles to fish. During the era whole new groups of reptiles (not just the dinosaurs but also the flying pterosaurs and marine reptiles such as the ichthyosaurs and plesiosaurs) evolved and became extinct. The mammals evolved, as did the birds along with the flowering plants. This varied saga of changing life and environments is also seen over a huge swathe of the North American continent, especially within the midwest and stretching right up through Canada to Alaska, forming a vast depositional basin that was periodically flooded by marine waters to form a midcontinental seaway that cut the continent in half. So what happened to this rock record of life and changing environments in the Canyon region? There is good evidence that the strata were originally deposited here, but what process could remove over a mile of rock? Clearly, there must have been regional vertical uplift, but to get an idea of what went on we have to have a closer look at the Colorado River itself. Unlike many of the world's important rivers, the Colorado has no significant link to the development of ancient human settlement or society. But of North American rivers, it is only exceeded by the Mississippi in length and is vital to some substantial modern settlements such as Los Angeles, Las Vegas and Phoenix, which through human engineering are 'watered' by the Colorado. These human habitations are located in inhospitable environments that could not naturally support their populations without the benefit of Colorado water. But the supply is finite and the development and control of the Colorado 'tap' have many interlinked social, political and technological problems. Scientifically, the river and its role in the development of the Canyon have been of great importance in our understanding of the more general problem of how rivers and their valleys evolve. Early investigations in Europe were bedevilled with unappreciated complications resulting from the development of high-latitude landscapes under ice age conditions. Charles Darwin seriously overestimated the possible duration of part of the geological record because he was trying to make calculations based on data from small, postglacial rivers sited in glacially enlarged valleys. With the benefit of hindsight, we can see that he had the right approach but wrong choice of location from which to derive his data. Since Darwin's days in the mid-nineteenth century, there have been two contrasting ideas about how river systems have developed. The most 'primitive' one is that there has been little overall change and that a river has a drainage pattern that is fairly fixed by the geological conditions since its initial development. Alternatively, a river system can be seen as a constantly changing entity that has evolved from certain ancestors and gives rise to descendent progeny whose 'appearance' will depend on changing factors such as climate and earth movements. For several decades after the Powell expedition, the general view was that the Colorado must have been born with a course more or less similar to its present one. The extent of the uplift, downcutting and erosion was seen as so great that the whole system must be very ancient and probably began at the beginning of Tertiary times, some 60 or more million years ago, following the retreat of the great inland seas. By the 1930s, it had become clear that no evidence could be found for an ancient, early-Tertiary Colorado drainage system along the present pattern. Still constrained by the single ancestral model, the conclusion had to be that the whole system must instead have developed in late Tertiary times. The whole basis of the interpretation was thrown into doubt in the late 1960s when it was recognised that there were early Tertiary drainage systems, but that they departed from the present pattern locally. Problematically, it seemed that the river had an early Tertiary age in its upper reaches but a late Tertiary age in its lower reaches. Furthermore, there was evidence that for at least part of its course the river had flowed in an opposite direction; that is, towards the northeast. All this new data and reassessment of old data led to the inevitable conclusion that the old model for the development of the drainage system was seriously flawed. It was replaced by the realisation that there were different phases in the history of development that could be radically different from one another. The antiquity of the upper reaches of the drainage system was accepted by most experts, but there were arguments about the lower reaches. Could it be possible that in late Tertiary (Pliocene times) a new stream that emptied into the Gulf of California could have eroded headwards and captured the ancestral Colorado somewhere in the area of the eastern Canyon today and only then begun to carve the gorge out? Although there is still no complete consensus on the river's history, there is a general acceptance of the capture of an ancestral drainage pattern by a young river connected to the Gulf of California. This led to the carving out of the Grand Canyon in a matter of just a few million years, no more than five and probably less. The cross-section of a gorge has a much smaller area than that of most normal V-shaped river valleys and so there is a much smaller total volume of rock material to be removed from a gorge. Nevertheless, the excavation of this immense gorge was still a remarkable feat and testament to the extraordinary power of natural forces and processes. Before the river's flow was regulated in the 1960s, the average daily discharge was close to 17,000 cubic feet per second (cfs), but rose to 77,500 cfs during annual floods and exceptionally as high as 300,000 cfs in rare flood events such as occurred in 1884. Such figures may not mean much, but as a comparative measure at a discharge of 32,000 cfs, 1000 tons of water are moving down the river channel every second. The average elephant weighs 5 tons, so it is like a 200-strong herd flitting past every second, or thirty 30-ton sauropod dinosaurs. The average daily load of sediment carried by the river exceeded 300 tons during normal flow, so imagine the volumes carried by major floods. Present control on the river has reduced sediment load to some 50 tons a day. The rapidity of the erosion was promoted by regional uplift of nearly 1 km (0.6 miles) since the formation of the lower river. The avalanching of rock debris fans from the canyon walls carries large boulders into the Colorado River where they form rock 'gardens' and rapids. the 'slope' consists in detail of a series of steep and turbulent rapids separated by many relatively tranquil pools. The rapids often form where rock debris from the canyon slopes cascades down into the river, forming debris fans and constricting its flow. Such constrictions increase flow rate and speeds of up to 33 ft per second (10 m/s) have been measured at Hermit rapids. And kayaks have been filmed shooting the Crystal Rapids at similar speeds, i.e. 36 kph (22 mph). The rock material in debris fans varies from small silt and sand particles up to metre-sized boulders. The maximum-sized debris moved by normal flow is cobble-sized, but when stream flow reaches $000 cfs its power is sufficient to move boulders up to 2 m (7 ft) in diameter. So flood discharges such as the 92,000 cfs recorded in 1983 would have a considerably greater efficiency in moving boulders and everything smaller from debris fans. The boulders are moved out of the constricted flow of the rapids and build up downstream where the flow widens and slows down to form what are known as 'rock gardens'. Normally the river carries fine grains of sediment and 'washes' these from the Canyon downstream. During annual floods larger, cobble-sized rock debris is moved inexorably towards the sea, and then there are those rare flood events that have a higher order of magnitude and can make radical changes to the river channel by moving even large boulders and flushing out huge volumes of finer sediment. It is only in recent decades that these different levels and frequencies of transport and removal of rock debris have been appreciated. Furthermore, it is likely that in the recent past high-magnitude floods were more frequent when rainfalls were higher. But the Colorado has also seen another, even more dramatic form of damming and flooding - that produced by volcanic eruptions. we have no difficulty as we float along, and I am able to observe the wonderful phenomena connected with this flood of lava. 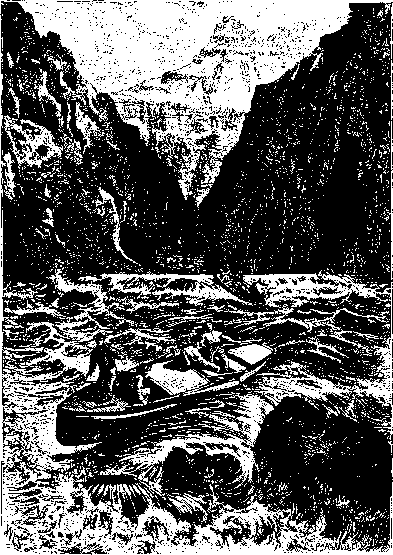 The canyon was doubtless filled to a height of 1,200 or 1,500 feet, perhaps by more than one flood. This would dam the water back; and in cutting through this great lava bed, a new channel has been formed, sometimes on one side, sometimes on the other ... As we float down we can see that it ran out into side canyons ... What a conflict of water and fire there must have been here! Just imagine a river of molten rock running down into a river of melted snow. What a seething and boiling of the waters; what clouds of steam rolled into the heavens! Thirty-five miles today. Hurrah! Powell's geological expertise allowed him to realise the implications of what he was seeing. But even his geological experience fuelling his vivid imagination could not have extended to the totality of what happened. The quenching effect of molten lava streaming into cold water causes it to contract so rapidly that it explodes. These events would indeed have been remarkable sights; so much for any idea of long-term tranquility in the gorge. The other important aspect that Powell could not have conceived of is the timescale. Radiometric dating of the lava flows has emphasised their geological youthfulness, and the fact that they have all been breached by the Colorado's erosive power has provided independent measure of the extraordinary rapidity with which the Canyon has been excavated. Today, anyone can view the spectacle from Toroweap, providing that they can interpret what they are seeing - one of the most dramatic displays of past volcanic activity in the whole continent. Over the last 1.5 million years some 150 lava flows have poured into the Canyon, with some flows being 200-300 m (600-900 ft) thick. Some originated on the Uinkaret Plateau and cascaded over the North Rim into Toroweap Valley and Whitmore Wash. Others flowed more directly into the Canyon, creating spectacular lava falls over the rim of the inner gorge into the river some 300 m (900 ft) below. Inevitably, as Powell realised, some of these flows filled the gorge, forming natural dams. Research has shown that these dams were up to 600 m (2500 ft) high, fifteen times as high as Niagara Falls and with twice the volume of discharge. One of the lava dams extended for 135 km (84 miles) along the Canyon. Behind them the waters of the Colorado backed up to fill huge lakes, just like modern manmade reservoirs such as the Mead and Powell lakes. Some of the natural lava-dammed lakes were so big that they back-filled upstream beyond the upper reaches of the Canyon into Utah, beyond the upstream extent of today's Lake Powell. When ponding water eventually overtopped a dam forming a waterfall, a new gorge would be eroded through the lava, leaving remnants attached to the Canyon side walls. There would have been a critical point when headward erosion cut through enough of the dam to weaken it sufficiently to cause a catastrophic collapse. Calculations - based on comparative measures from Niagara Falls, which has cut through 18 km (n miles) of rock in 8000 years - suggest that most of the lava dams would have been destroyed within 20,000 years of their formation. At least 13 such lava dams, formed over the last million years, have been identified and their total life probably amounted to not much more than 250,000 years. Over this time the Colorado cut down through a total thickness of some 3390 m (11,300 ft) of hard basaltic lava. The alternating filling and catastrophic emptying of lava-dammed lakes has also left a patchy record of high-level lake and river deposits, often stranded as terraces high on the Canyon sides above present water levels. Detailed study of these deposits helps reconstruct the development of the river system and preserves important records of early human activity. Lakeside 'beach' sediments contain remains of agriculture, stone buildings and even sometimes signs of more short-term camping by prehistoric people. Most of the archaeological artefacts are associated with the Anasazi people and date from 1000-1150 AD, although some are as much as 2800 years old. Modern river and poolside beaches are also used for camping by the thousands of rafters who ride the Colorado rapids these days. A critical feature of river valley formation is the rate of retreat and enlargement of the valley sides. Weathering and erosion of the Canyon walls deposit debris in the valley bottom. The Colorado River then removes the rock debris so effectively and rapidly that the stream channel has little chance to be protected from further downcutting by the accumulation of sediment, as happens in the middle and downstream portions of most river systems. Where canyons such as the Grand Canyon form, and the river is still contained within a relatively narrow channel at the base of the gorge, the rate of downcutting is relatively high compared with the retreat of the valley sides. Again, measures obtained from dated lava flows and their erosion show that the erosive energy contained within the Grand Canyon system is so great that the Canyon walls are retreating at a rate of one or two miles per million years. The history of erosion and slope retreat in the Canyon has been set off and governed by tectonic uplift. Such movements, especially where they are related to major faults, are essentially episodic and occur in pulses. Individual fault movements, even on major faults, only amount to a matter of a metre or so at a time. However, they tend to occur in clusters, which can add up to tens of metres separated by quiet periods with little activity. The rocks of the Grand Canyon are dislocated by a number of active major faults whose history of movement extends back over the last 4 million years. The underlying forces are those of stretching in a northeast-southwest direction, resulting in fracture of the brittle crustal rocks. The region is part of a seismically active belt (called the Intermountain Seismic Belt) that runs north-south through central Utah. Over the last 50 years there have been five earthquakes with a magnitude of 9.0 or more on the Richter scale. By comparison, the earthquake that devastated San Francisco in 1906 is estimated to have reached 8.3 on the Richter scale. Only the remoteness of the Canyon and the lack of large-scale human habitation have prevented such quakes from receiving much attention. The erosion and enlargement of the Canyon have involved the cutting down of the river channel and the recession of the Canyon walls. The rock debris derived from these processes would soon accumulate and choke the Canyon, were it not for a continuing removal of the debris by the river, which has flushed it downstream. As we have seen, research over the last few decades has shown that all these processes can be very complex and that the history of events is far from being the gradual one that was originally envisaged. On-going processes, such as river flow, can be directly observed and measured, as can regular and predictable events such as seasonal storms and associated floods. However, unpredictable and rare events, such as avalanches and debris flows, are much harder to observe, especially in such a large area, much of which is very difficult to access. Debris flows, for instance, have rarely been observed, but their effects and deposits are important features in the Canyon, especially where they have formed large fan deposits. To uncover and reconstruct the history and development of the Canyon, scientists have had to investigate any signs of past processes recorded within the present topography and deposits of the Canyon. And then the scientists have to interpret their significance, not an easy task at the best of times but one that is made especially difficult when the age of the features is hard and sometimes impossible to discern. 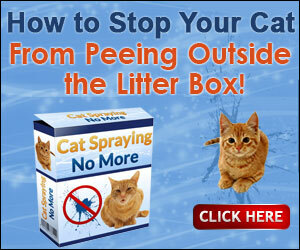 However, the problems of dating have spurred investigators to come up with a number of ingenious methods. Modern understanding of the processes of surface weathering has allowed the development of various techniques for measuring the length of time over which rock debris and sediment on the debris fan surfaces has been exposed to the elements. Wind-blown sand can, over time, polish the exposed surface of boulders. Splitting, spalling and disintegration of boulders, especially those made of sandstone, also happen over time. But most useful is the solution of limestone boulder surfaces exposed on the fan surface. Rainwater, which has been weakly acidified by atmospheric carbon dioxide to form carbonic acid, will over time slowly etch limestone. Experiments have shown that dissolution happens at a rate of about 2.6 mm per 1000 years. The oldest known are a few limestones on fan surfaces at the mouths of the Forster and Fossil Canyons and these have 17.4-mm-deep solution pits, which makes them around 4700 years old. By comparison, the youngest fan surfaces dated by this method are between 500 and 600 years old, having pits averaging 1.2 mm deep. Interestingly, the average age difference between large debris fans within the Canyon is around 820 years (with a range of between 500 and 1200 years), which shows what rare events they are. In addition, analysis has shown that, over the last 4000 years of Holocene time, there were five separate phases when large-scale debris flows were particularly common; that is, around 800, 1500, 2100, 2900 and 4000 years BP. Some 75 per cent of dated fan surfaces are less than 2900 years old and it is likely that these phases coincided with increased rainfall, but it has yet to be proven. This rarity of occurrence is why the chance of observing a large-scale debris flow happening is very low, and yet these are major events that have a considerable impact on the development of the Canyon. Despite their rarity, luckily a few debris flows have been observed and recorded. The deposition of a layer of sand or gravel cannot be dated chronologically unless it contains some sort of 'clock' that actually recorded the act of deposition. The most common type of 'clocks' for such deposits are fossils which contain organic carbon that can be dated by radiocarbon methods. Unfortunately, such fossils tend to be very rare in these kinds of deposits. Analysis of pebble type can be very useful in telling us where they originated from. For instance, some pebbles of a distinctive igneous rock are known to have travelled all the way from sources in mountains of the Colorado Plateau and San Juan Mountains. And sometimes deposits have enough distinctive characters that allow them to be matched with similar deposits of known age elsewhere, in which case a similar age can be given, albeit cautiously. The great 'watershed' in the recent development of the Colorado system and the Grand Canyon was the closure of the Glen Canyon Dam in 1963, which had a profound effect on the flow of the river. Flow was reduced drastically, as was the capacity of the river to carry away sediment and rock debris from the Canyon bottom. Sediment will gradually fill up the reservoir behind the dam, but it has an estimated 'shelf life' of 1200 years. Anyway, the Holocene history of the canyon can be sharply divided into pre- and post-dam phases. From the human historical point of view, the most interesting of the pre-dam deposits are those that can be dated using 'fossils', including both natural and human artefacts. The oldest radiocarbon date of 4500 years BP comes from the upper Marble Canyon. Natural driftwood found in some of terrace deposits mostly belongs to the western honey mesquite tree (Prosopis glandulosa var. torreyana) and has no value for relative dating, but can be radiocarbon dated. Rare cottonwood fragments with tell-tale beaver cutmarks tend to be restricted to some older and higher terraces. The presence of milled driftwood cut by modern methods indicates younger deposits. The oldest datable archaeological artefacts are ceramics from between 800 and 900 AD, technically known as Pueblo I. Younger, Pueblo II and early Pueblo III ceramics indicate that deposition of the older river deposits ended between 1150 and 1200 AD, which probably coincided with Anasazi people leaving the area. The causes of the alternating deposition and erosion are not fully understood, but probably relate to changes in climate. Ultimately, the water in the Colorado system is derived from melting snow up in the Rocky Mountains, while the sediment mainly comes from tributaries draining the Colorado Plateau. Consequently, any significant climate change in either area could have had an effect in the Canyon. Interestingly, modern deposition within the last few decades that cannot be resolved by radiocarbon dating can sometimes be dated using tree-ring dates. Post-dam construction deposits can be dated by modern artefacts such as drink containers. Partly degraded plastic containers along with beer and soda-pop cans without disposable tabs generally date from the 1980s. Ancient lake terrace deposits form beaches containing wood and artefacts up to 4000 years old reflecting their use by humans in the past. patterns that change with time, so much so that the descendants bear little resemblance to their ancestors. Much of the recent geological history of the Grand Canyon region is cryptic - it is hidden away in the several caves that penetrate limestone strata throughout the Canyon. For many years now the caves have been prospected for their fossil remains, which provide us with vital clues about life in the Canyon over the last few tens of thousands of years (to around 50 ka) through the latter part of the Pleistocene ice ages. Fossils recovered from the caves tell us that previous inhabitants of the Canyon included condors, big cats, mountain goats, shrub-ox, camels, horse, wolves, packrats, ground squirrels, voles, lizards and snakes, not to mention hosts of bugs and of course the plants on which they all ultimately depended. Last but not least, humans have occupied some of the more accessible caves, leaving artefacts dating back some 4000 years. Within the overall story of the latter part of the ice ages in North America, the picture provided by the Canyon is a very particular one. However, we shall digress where necessary to get a wider view. The Colorado River's deep incision into the strata underlying the region has exposed thick limestones that are entirely of pre-Mesozoic age. There are two main sequences of limestones separated by a 350-m-thick succession of clastic sedimentary rocks (sandstones, siltstones and shales). The uppermost and younger carbonate sequence is made up of some 22$ m of mid-Permian-age limestones, dolomites and gypsum-rich evaporites comprising the Kaibab and Toroweap Formations. The lower and older carbonates descend from the massive Redwall Limestone of Mississippian age, through the Devonian Temple Butte Formation into thin-bedded and shaly carbonates of the Cambrian-age Muav Limestone. Rocks of this kind, which are mostly made of limey (calcium carbonate) minerals, can be slowly dissolved even by slightly acidic rainwater to produce distinctive fretted-surface landforms known as karst (as we have seen, derived from the Slovenian word 'kras' meaning stone). Dissolution continues as water makes its way underground with the opening and enlargement of fissures, pipes and channels, which may eventually collapse to form caverns. The processes of karst formation have happened throughout Earth Time and there is an important distinction to be made between previous 'palaeokarst', which is no longer active, and present active karst development. There is evidence for both in the Canyon limestones. Ancient 'palaeokarst' developed mostly during gaps in the deposition of sedimentary strata, when the region was elevated above sea level to form a terrestrial landscape open to the processes of weathering and erosion. I will mention these 'palaeokarst' phenomena here because many of them have been reactivated in more recent times. One of the best-developed 'palaeokarst' surfaces lies at the top of the Redwall Limestone. During late Mississippian times (around 325 ma), North America and western Europe straddled the equator. High sea levels flooded vast areas of the continent with warm and shallow seas in which a huge diversity of marine life flourished. Then regional uplift brought some of these newly deposited and lithified carbonate sediments above sea level, to be exposed to an equatorial climate. The prevailing high temperatures and often torrential rainfall rapidly produced intense karstification of the landscape of the kind seen today in Tsingy de Bemaraha, a World Heritage Site in Madagascar. Numerous surface solution hollows called dolines opened and fed water underground, where it flowed laterally and dissolved extensive interconnected cave networks in the limestones. Similar processes are at work today, forming karst landscapes in subtropical Florida. The sea returned in late Mississippian times and deposition continued through Pennsylvanian into Mesozoic times, burying the karst landscape beneath several hundred metres of sediment. This heavy loading caused collapse, infill and cementation of the ancient karst surface and its subsurface cavities. 700 m deep and extend through the remaining Palaeozoic strata and into younger Mesozoic deposits that existed at the time. Importantly, some of these pipes became mineralised with the deposition of minerals of economic value such as copper ores (Grandview pipe) and uranium ores (Hack Canyon and Orphan pipes). Regional uplift continued through late Cretaceous and early Tertiary times when the incision of the Colorado River began. Inevitably, this substantial elevation of the landscapes and their groundwater rejuvenated underground flow and exhumation of ancient caves in the Redwall Limestone. As a result, some of these, such as the Horseshoe Mesa caves, have over 1000 m of open passageways. Continuing elevation of the regional crust and lowering of the water table has now left these caves high and dry some 1200 m above the present level of the Colorado River. Nevertheless, there are still active springs close to river level that drain groundwater from the Redwall Limestone. Massive and beautiful travertine deposits, such as Travertine Falls below the South Rim of the Canyon, have built up around the outflow of some springs (such as the Havasu and Blue springs). Travertine is a rock made of calcium carbonate that is spring deposited. When carbonate-rich water is exposed to warm and dry air it loses carbon dioxide to the atmosphere and its calcium carbonate, previously dissolved by the water, is reprecipitated. The resulting deposits often form terraced cascades where the water has already been heated underground. World-famous examples are to be seen in the thermal springs, such as the Minerva Terrace in the Yellowstone National Park, Wyoming, and at Antalya and Pamukkale in western Turkey. The former comprise the largest freshwater carbonate deposits in the world and the latter's spectacular terraces were declared a World Heritage Site in 1988. Rainwater falling on the plateau surrounding the Canyon drains vertically through solution conduits so that there are hardly any horizontal caves in the Permian-age Kaibab and Toroweap Formation carbonates and evaporites. Water then moves through the underlying Pennsylvanian-age Supai Group clastic strata into the lower Palaeozoic-age carbonates. The largest caves here have passageways that have been surveyed over distances of 2000 m. Roaring Spring Caves supply water for the tourist facilities at both the North and South Rims of the Grand Canyon National Park. Most of the caves seen today within the Canyon lie within the upper part of the Redwall Limestone. They are ancient ones that have been re-excavated by modern processes, but only for a short distance back from the present cliff faces, and their original deeper recesses are still blocked. Given the topography of the Canyon, many of the caves can only be accessed by small, agile animals such as rodents or those capable of flight such as birds (especially raptors) and bats, and of course specially equipped human climbers and cavers. Many caves have small entrances that restrict the size of their inhabitants, but a few are larger with walk-in entrances accessible to larger animals such as mountain goats and felids (cats) such as pumas and occasionally horses and camels. However, remains of the latter are usually restricted to single bones brought into caves by scavengers such as wolves and felids. Naturally occurring caves provide refuge from enemies and the elements and have been used by animals and humans ever since there were animals around to occupy them. Fossil evidence from cave deposits tells us that even during the glacial maximum between 25 and 18 ka (thousands of years ago), the region was more wooded than it is today with a mixture of broad-leaved deciduous trees and conifers such as juniper, pine, ash and Rocky Mountain maple. Animals present ranged from woodland snakes to camels and Harrington's mountain goat. With improving climate and warmer and drier conditions, shrubs such as roses appeared, while currant (Ribes) and sumac (Rhus) disappear around 12 ka. 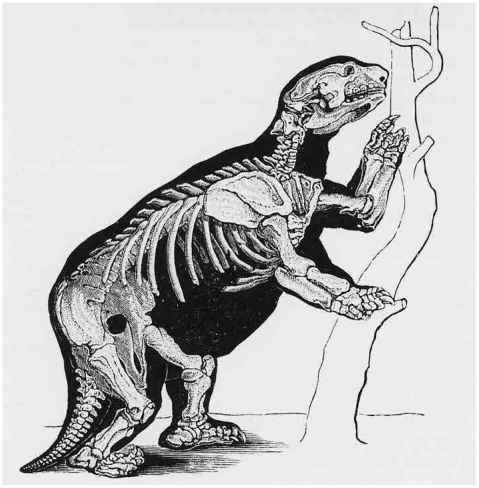 An extinction of local large animals such as Harrington's mountain goat and the Shashta ground sloth occurred around 15 ka. This may reflect a final crash of their populations in the face of changes in the plant cover, which could no longer support viable populations of animals of this size. Analysis of sediment and faeces from packrat middens that contain plant pollen suggest that the vegetation changed in stages. The most famous of the Canyon's caves was discovered in 1936 by Willis Evans, a National Park Service employee, at the base of the Muav Limestone about 200 m (700 feet) above the river. Rampart Cave, as it became known, turned out to be a real treasure trove of Pleistocene life, with exceptionally well-preserved remains of a variety of animals ranging from the desiccated guts, hair, dung, claws and bones of the Shasta ground sloth Nothrotheriops shastense to remains of camel, mountain goat and extinct horse. According to Evans, the remains still smelled quite fresh and 'fragrant' when they were excavated. Analysis of the sloth dung has given a wealth of information on the animal's diet and way of life. More than 72 kinds of plants have been identified from the pollen, seeds and other plant fragments in the dung, showing that the sloths were omnivorous browsers. By eating such a variety of plant material they avoided the build-up of toxins specific to any one plant. Even the remains of parasites have been preserved in the dung. Fossil evidence, mostly from caves, indicates that the Shasta ground sloth ranged from northern California right down into Mexico and for nearly 100,000 years from 111,900 ± 13,000 to 15,030 ±210 years ago. Most of the cave floor deposits seem to have virtually ceased accumulating around 20 ka, which is the age of the cave floor surfaces apart from a thin veneer of more recent pollen and dust. The development of the modern dry climate conditions has helped preserve the quality and quantity of cave deposits and their contained fossils. Up to 6 m (20 ft) long and weighing about 3 tons, the giant ground sloth was a remarkable beast that has its own special place in our history on a number of accounts. 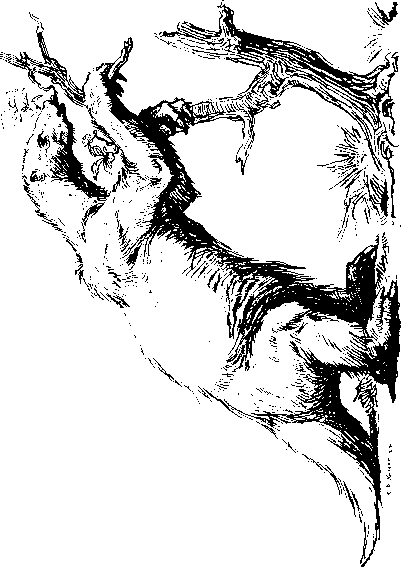 The surviving sloths are primitive placental mammals famous for their 'slothfulness' and common habit of hanging upside down from tree branches by their specially hooked claws. But they were not always like this. The ground sloths first evolved in South America and took the opportunity to move into North America when the two continents were first connected by the Panamanian 'land bridge' in late Miocene times, around 9 million years ago. Another wave of sloths made the trip north in late Pliocene times (about 2.4 million years ago). They were an important member of the extraordinary two-way exchange of organisms, both plants and animals, which must have passed one another on this remarkable intercontinental 'freeway'. Sloths evolved into several groups and numerous species (13 in North America), but the last died out at the end of the last glacial around 11,500 years ago. Giant ground sloths such as Mylodon were amongst the largest mammals in the Americas, now their much smaller living descendents are confined to South America.